The historic small towns that dot the river-front and countryside offer a variety of activities for all ages and interests. Start your exploration of the Valley in the South, where the St. Croix meets the mighty Mississippi then traverse your way up one of the scenic state highways or county roads that lead to quaint small towns, pristine parks, artist’s studios, galleries, antique shops, wonderful restaurants or local cafés. Your visit may include staying at a cozy bed and breakfast, pampering yourself at a spa, or shopping for antiques or gifts at one of the valley’s scores of fine shops and galleries. Outdoor enthusiasts can enjoy bald eagles soaring between rugged cliffs and rock formations on the Upper St. Croix, meadows of wildflowers dancing in the wind, quiet landscapes, beautiful vistas, and wildlife viewing from roadways, waterways, railways and trails. In winter, take in the Hudson’s Hot Air Affair hot air balloon festival, traverse the snowy landscape via skis, snowshoes, snowmobiles, dogsled or spend the day skiing at one of the valley’s ski resorts. 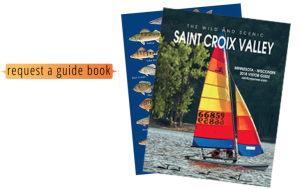 The scenic St. Croix valley is an ideal place to find respite from everyday living. Enjoy the events and attractions as thousands of others have. Your choices are many – just follow the river.